I'll talk about Book In A Week in a moment. First, I want to share that I have a writing book for young people, too. 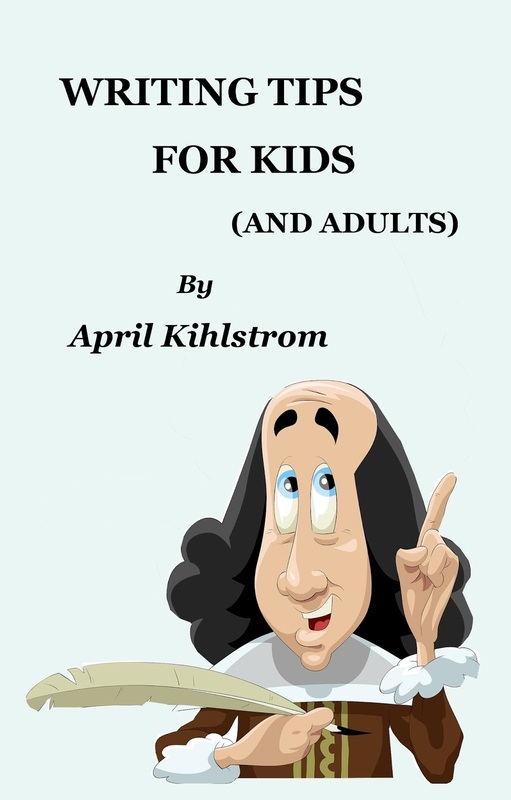 The old version of Writing Tips For Kids has been replaced with a new and substantially revised edition. If you have the old version, you should be able to request the update from Amazon (if you didn't get the update automatically). It's also now available in print and on various other vendor sites. I teach Book in a Week in workshops and in online classes. I will be posting here when I have a new online class--Book in a Week or other classes--planned. 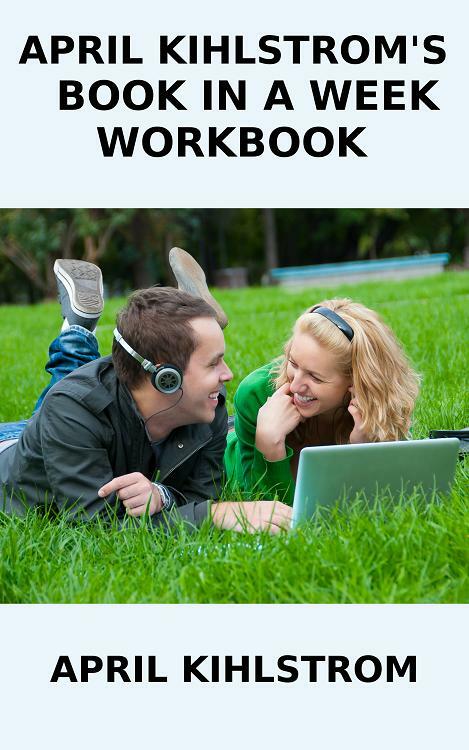 And now for the information about my workbook. Please note that I strongly recommend using it in a spirit of PLAY. Dip into it. Use it to discover what questions jumpstart YOUR creativity. Write or draw or paste in pictures for your book. Do what works for YOU! In paperback on Amazon and Barnes and Noble. Most of us write linearly but brainstorm in a nonlinear way. If one thinks of writing a book as being similar to putting together a puzzle, this workbook is intended to help writers create key puzzle pieces. 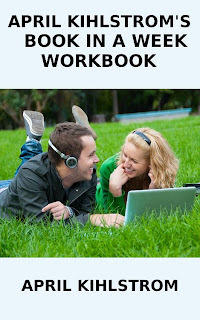 This workbook is intended to help writers brainstorm and plan out their books in a way that is organic. 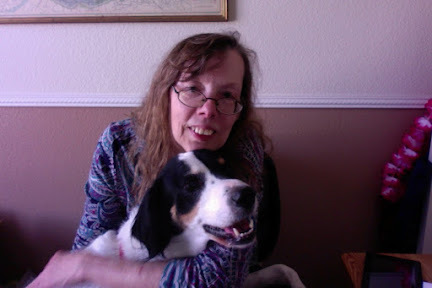 April Kihlstrom was one of the first writers to embrace the concept of Book in a Week. She has been teaching the material in workshops and online classes for years. All of the material in this book comes from her experience both as a multi-published author and in teaching these workshops and classes. Note: This is copyrighted material. Relax. Deep breath. Smile. Writing a book is like putting together a jigsaw puzzle—except we have to create all the pieces, too! To get back to the joy and freedom you felt playing make believe as a child and/or writing your first book. Discover the optimal method for YOUR life and how YOUR brain works. Affirm to yourself and those around you that you ARE a writer and writing matters. Write faster, cleaner and with fewer inconsistencies. Discover in just one week whether or not your project will work, if you actually WANT to write this book and maybe what else you may need to research and/or figure out to make it work. If you're doing a series, get a quick sense of how each of the other books may play out. Enlist the support of everyone willing to help and/or encourage you—do not tell saboteurs! Remind yourself that YOU and YOUR writing matter! Remind yourself it's only one week—how often have you wasted more time than that not writing because you were afraid of getting it wrong? It's an EXPERIMENT—no matter what you will gain information. Decide to trust your subconscious—it knows far more about your story than your conscious mind does. Know WHY you want to write THIS book. Why it matters to YOU emotionally and what you want READERS to remember long after they finish reading the book. Use index cards or some means of creating organized notes for yourself about people, places and events in your book—create an outline if that works for you and/or use the event index cards to plan out your story. Use the exercises in my workbook—or whatever exercises you know work for you. If nothing else, you're cueing your subconscious to work on what you need to know! Study the sort of book you want to write. What expectations will readers/editors have? Why do YOU care about the story? Get a folder of some means to organize all your notes, research, character sketches, outlines, etc. Keep it handy during the two writing weeks. Get a notebook and/or voice recorder or figure out how to make notes with an app on your smart phone so that whenever you need to leave your writing area—to run errands, etc.—you can take it along and either work on a scene or make notes for what you will write when you get back to the computer. Have a notebook—or some other means--to jot down real life things you need to do when you take a break. Write. Keep writing. Do not go back and reread what you’ve written. Keep something handy to jot down day to day life things you think of that will need to be taken care of WHEN YOU TAKE A BREAK. If something comes up that MUST be taken care of immediately, take care of it then go back to writing. If you have an off morning or day, don’t beat yourself up—just get back to writing and keep going. If you have trouble typing for long periods of time, you may want to look into a voice recognition (to text) program. But try it out BEFORE your actual writing week. If you make changes, KEEP GOING! You will fix earlier writing AFTER the writing weeks are over and the first draft is done. If you go back and change things, you may lose something important. If you think of something new to insert in an earlier part of the book, you have two choices. If you have iron will power and can go back and write the new material WITHOUT rewriting the surrounding material, do so. If not, just go back and insert notes about the changes in colored or highlighted font. Or simply write down a note to yourself and put it in the folder or notebook you keep handy while you work. Eat nutritious foods, drink plenty of water. Having cut up fruit or veggies or cheese or prepared food in the refrigerator can be a lifesaver when you are in the middle of BIAW. Make sure you get up and stretch and move around at least once an hour. Just the act of moving can shake things up and get you past a sticking point—especially if you go (briefly!) into another room. If you get ideas for another project, take 5 minutes to jot them down—THEN GO BACK TO WRITING! Make notes for things you will need to research so that after the writing week is over, you can do the research and fill in the information in your story. Jot down things you realize about your characters on their index cards (or whatever method you're using). Let (supportive!) others know how you're doing as an incentive to keep writing. Close your eyes. Deep breath. Relax. Smile. Remember what it was like to play make believe as a child. Remember the best moments you've ever had writing. Imagine finishing the manuscript and a call from an editor asking to buy the book or hitting the best seller lists if you self-publish. Picture signing copies for adoring fans. Jump to the next scene and keep going. Start throwing in anything you can think of! Change WHEN you're writing—this is an experiment! The more you try the more data you get. If you seem to be getting nowhere, try writing in short blocks—15 minutes at a time, followed by 5 minute breaks and then 15/5 minute sessions all over again. Get up and move around for a couple of minutes. In fact, if you're writing steadily, you should get up and move around for at least 5 minutes every hour anyway for health reasons. Let someone SUPPORTIVE know how it went. MAKE NOTES FOR YOURSELF on what you need to write the next day. Take a few minutes—after you make your notes for the next day—to unwind. CELEBRATE being a writer and having the guts/determination to sit down and write. This is as important as any other step in the process! When did you write best? When was it hard or you couldn't write? Where was it easiest to write and where was it hard or impossible to write? How did you write best? (ex. Long hand, computer, voice recorder, etc.) What didn't work? Who was supportive and who wasn't? Note patterns or what you notice about your “voice”, tone/style, your characters, themes, etc. What surprises you about what you see or learned about your process and/or writing and/or BIAW itself? What strengths showed up in your work? What weaknesses? Relax. Play with possibilities. Let everything you've learned sink in. Collect notebooks, pens, a folder, etc. Set up work area—brighten up work areas so you feel more like writing. Pick a character and jot down everything you know about him/her—profession, family, hobbies, etc. For each—fears, hopes, dreams--ask a key question. Ex. : Given the hero’s (or heroine’s) fears, what would allow or force the hero to rise above those fears? Brainstorm possible themes for your story. List as many plot points/events as you can think of for your story. Choose one scene you know you will need and jot down everything you know about it. Picture yourself succeeding. We are all very good at imagining all the things that can go wrong, but a few minutes imagining everything going right can have a powerful impact as well. Write out a conversation between a character and someone else—maybe even another person who does NOT appear in the story. If you have my Book in a Week workbook, flip it open to any page and let one or more of the questions jumpstart your brainstorming process. Social media. Setting a time limit is a good idea. Use social media to interact with people. If you are trying to decide between several projects, allow 10 to 15 minutes for each one. For each block, write as much as you can, as fast as you can on a project. (The project to work on is the one where you forget to stop after 15 minutes and keep going OR the one which, when you reread it, really grabs you.) Note: This can also be done in separate 10-15 minute blocks of time—rather than all at once, one right after the other but it's good to do it when you're in the same frame of mind. Fill the creative well—read from a book or story that really inspires you. Do research—but be careful that it doesn’t eat up all your time! This is where setting a 30 to 45 minute time limit can be very useful. If you plan to self-publish, research and/or arrange for editing, copy-editing, formatting, covers, etc. Set a time limit! It's way too easy to get lost in this just like with any other form of research and setting a limit makes it less likely you will feel overwhelmed by the options. Just write—you’d be surprised how those short blocks of time can add up. Jot down ideas you have for later in the story. It’s not a bad idea, each day, if you have a cluttered desk like mine, to take 5 minutes and just get rid of one bunch of paper or change one thing to brighten your writing area. Picture yourself succeeding—especially if you’re feeling discouraged! Just write—this is a long enough block of time to write a couple of pages or part of a scene. If you get stuck or have a tough time getting going, write in 15-minute blocks of time. (Get up and move around afterwards.) Maybe set a timer. Odds are that at some point the words will start to flow. If you need a break, go on social media and interact with others. Be authentic and human. If you plan to self-publish, once you know how soon your book will be done, contact the editor(s), copy-editor, formatter, cover artist, etc. to get on their schedules. Choose a short block of time when you need to write something difficult or painful. Set things up so that at the end of that block of time you have a cup of soothing tea or coffee or SOMETHING ready and do something soothing. Before you start, take a moment to remember the good things in your life so you FEEL safe enough to write that difficult passage. In other words, you don't want to let yourself become overwhelmed and you want to remind yourself that NOW your life can be good. Tackle a complex scene that needs to be written all at once because otherwise you might forget what’s going on or what needs to be in there. Let the words just flow. It’s only 30 minutes—if it doesn’t work, so what? We’ve all wasted more than that afraid to get it wrong. If this doesn’t work, you can take another 30 minutes and rewrite it later. But there is power in letting go of the rules and just writing—seeing where your ideas and/or characters take you. The philosophy of Book In A Week can be adapted to any block of time—no matter how short. Whether it’s a week, a weekend, a couple of hours or 30 minutes, give yourself that permission to just write—write anything that wants to come out. You can always edit/rewrite later. Often there are easy revisions that can be done in 5 to 10 minutes. Maybe it’s adding eye or hair color for a character, rewriting a clumsy sentence, etc. Jot down notes for things you want to change—or rather how you think you want to change them—when you have more time. If you get stuck on revisions, look at the brainstorming exercises from my Book In A Week workbook, if you have it. Do you have all the suggested scenes/emotions? If not, take a 15-20 minute block of time to work on one and see if that solves the problem. Ask yourself what was good—or could be good—about getting THIS rejection letter. Ans yourself what might be right about any feedback the editor or agent gave you. If any of it IS useful, send the editor or agent a thank you note. If you self-publish, arrange for editing, copyediting, formatting, covers, etc if you haven't done so before. If you plan to do any of those things yourself, use this block of time to do research on that element of the process. Maybe experiment with how you will do it. You still want to set a time limit to minimize feeling overwhelmed or too frustrated. If you DO get frustrated, get up, walk away, do something for at least a few minutes and ideally much longer before you sit back down to try again. Social media. Interact so when your book comes out, it doesn't feel to others there as if all you do is promote your work. A short block of time is ideal because it's way too easy to feel overwhelmed otherwise or have it swallow up huge heaps of time. Create at least the bare bones of a newsletter (if you're published) or blog post to keep readers up to date on what's going on. Look at how others are promoting their work and see what might be a good fit for YOU. Work on revisions and make the most significant changes first. Every change will have a ripple effect and when you make the most significant changes first, you may find some of the other problems disappear and/or can be fixed as you make the global change(s). If you self-publish, handle details related to that—whether it's monitoring sales on websites, setting up promotions, handle book keeping, etc.--but you still want to set a time limit! Interact with readers and/or your street team—if you have one. If you have an assistant, go over what needs to be done over the next week or month (depending on what the assistant does for you). After you finish the manuscript—celebrate. After you mail out the manuscript—celebrate. Evaluate your writing experience—what worked, what didn’t, what you might change in the future. Plan and start writing your next book! There is value in setting blocks of time. It limits the likelihood of feeling overwhelmed by any task. It forces a break that can cause your brain to shift, while you do other things, so that when you start another block of time for that task, you may find your subconscious has figured out solutions for those things that were giving you problems. It gives your subconscious time to look at things at deeper levels so you realize what you might not have if you had pressed through to the end at the start. There's another factor here. Short blocks of time make it more likely you will stop after a success—rather than always working until you hit a brick wall. This means your subconscious will begin to associate success with the process—rather than failure. This makes a huge difference, over time, to whether or not we want to do whatever step we're talking about. Finally, mixing things up gives our subconscious a chance to cross-pollinate ideas, so to speak. 15 minutes on social media may give you an idea for some element to include in the story that would make it easy to promote once it's publlished. Working on ideas for a cover might make the whole process feel more real. And so on. Bottom line: Many writing tasks can be done in short blocks of time, fitted into a busy schedule. We do not always have to do them in the expected order! Building experiences of success, in small ways, makes it much easier to do the more difficult tasks—and believe that we can. Finally, make sure you build into your day reasons to smile—no matter how well or badly things are going with the writing or anything else! Make a list of things that make you smile—the longer the better. Every day do at least 3 things from the list that make you smile. On rough days, do even more. As silly as it sounds, truly this will help. And if you do something that makes you smile right before and right after you write, you are likely to find you begin to really look forward to writing—because your subconscious will associate it with feeling good!